The commercial exploitation of the Candelilla plant for producing wax dates back to the beginning of the 20th century, and has since become one of the main economic activities of the Mexican region of the Chihuahuan Desert. There are more than 3,500 small producers of wax from this plant, who are known locally and nationally as “Candelilleros”. Some of these producers complement their income by gathering other plant species native to the desert, or by agriculture, raising cattle and even mining. Unfortunately, the manufacturing of Candelilla wax is still carried out using old and inefficient techniques which remain virtually unchanged since this activity first began. This is evidenced by the low yields and high costs in producing the wax. The method used for the exploitation and distribution of the Candelilla plant is very rudimentary. 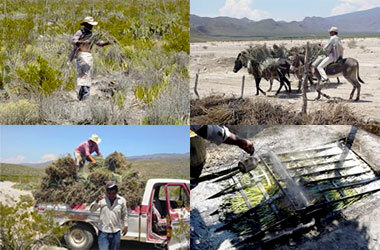 Harvesters travel by burros (or by truck) to the areas where the Candelilla plant is to be found in abundance. After gathering all the plants found in the area, they load up and move to other nearby fields. Normally, the Candelilla plant is pulled out by hand from the roots, although occasionally a sharpened stick may be used to facilitate digging out the plant. Bundles of 20-30 kg (44-66 lb) of cleaned Candelilla plants free of dirt, stones, weeds, etc. are prepared for transportation. Each burro can typically carry from 60-90 kg (132-145 lb). Pickup trucks are also sometimes used. 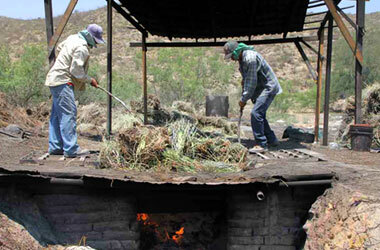 The plants are then brought to collection centers where the process for extracting the wax is carried out. The “Candelilleros” work long, hard hours. They generally take more than five days to harvest the plants and work becomes more complicated when the plants are located on other ranches or private property. The distances from gathering points to the collection centers can range from 25 to 150 km (15 – 100 miles). To extract the wax, the Candelilla plants are placed in iron cauldrons – called “pailas” by the Candelilleros – with a mixture of water and sulfuric acid. The batch of Candelilla immersed in acid-water is heated over a direct fire until the solution comes to a boil, at which time the wax is separated from the plant and fuses with the liquid. The sulfuric acid prevents the formation of an emulsion between the wax and water, which could occur due to the turbulence created by the boiling process. Using this technique, wax from the Candelilla plant floats to the surface in the form of foam. The hot foamy wax is removed from the “paila” using utensils with openings called “espumaderas” (foamers), and is collected in steel tanks, buckets, conical holes in the floor or in clay molds placed on the floor. In any of these vessels, the hot foam (wax) is separated by decanting from a brown liquor which precipitates to the bottom of the vessel and is later recycled to a removal bucket. In the intermediate part of the vessel, just on top of the aqueous phase, a fine layer of yellow-colored cream is formed. This is the Candelilla wax, known also as “cerote”. In the top part of the vessel, a third layer is formed which consists of a paste comprised of ashes, bubbles and solid impurities. 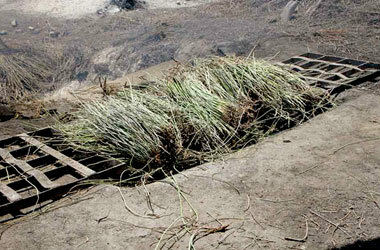 The plants, scalded by the boiling process, are used as fuel for the cauldrons, once they have been put out to by sun-dried. The “cerote” is left to cool and solidifies at ambient temperature. The solid wax is hammered and broken into pieces, which are then melted to remove the impurities such as dirt and organic materials, which are separated from the wax by sedimentation. The wax, which is then decanted – free from impurities – is known as “raw Candelilla wax”; it is left to cool and solidify again. In order to refine the wax it must again be broken up, melted and filtered through Fuller earth, activated carbon or some other filtration system. The refining can also include a bleaching stage, which uses hydrogen peroxide, or some other refining step for special applications. Collection, extraction and refining processes.